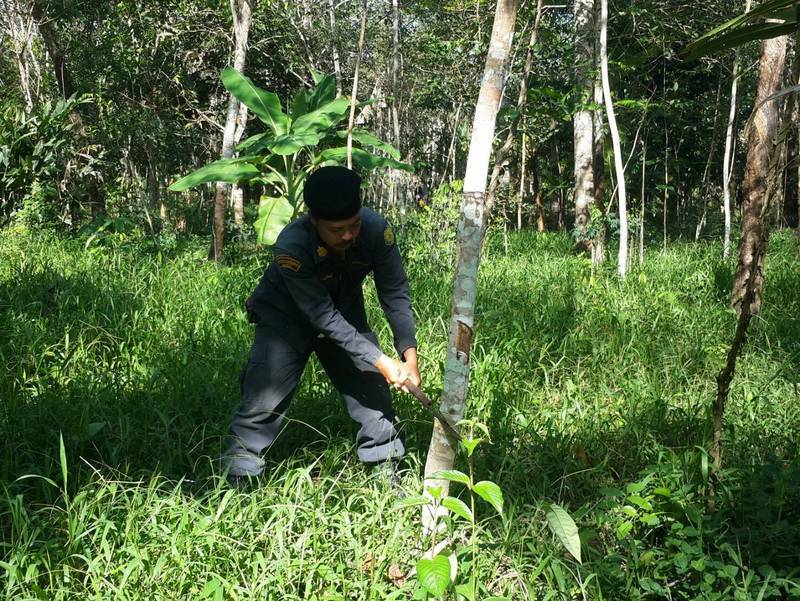 PHUKET: A multi-agency task force of more than 100 officers, accompanied by armed soldiers and navy security personnel, removed illegally planted rubber trees covering 122 rai in the Bang Kanoon protected forest in Phuket’s Thalang District yesterday (Dec 19). 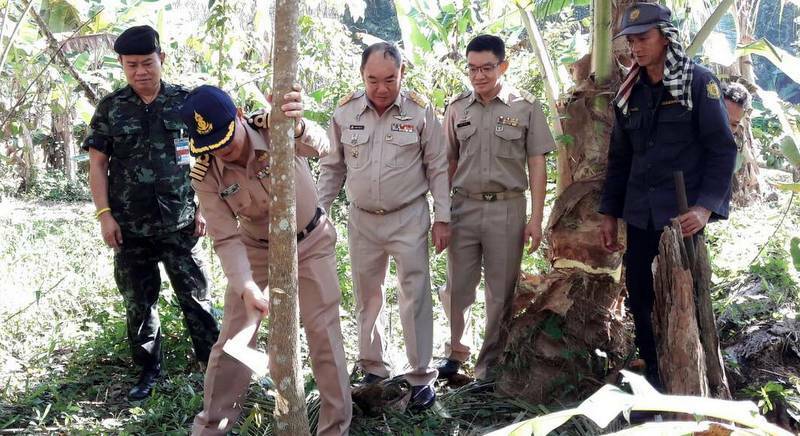 The operation began at 9am, led by Capt Bowaorn Promkaewngam, Deputy Chief of the Phuket Provincial Internal Security Operations Command (Isoc). Joining him were more than 100 officers from the Royal Thai Army 41st Military Circle, the Royal Thai Navy Third Naval Area Command, the Thalang District Office, the Royal Forest Department and the National Park, Wildlife and Plant Conservation Department (DNP). 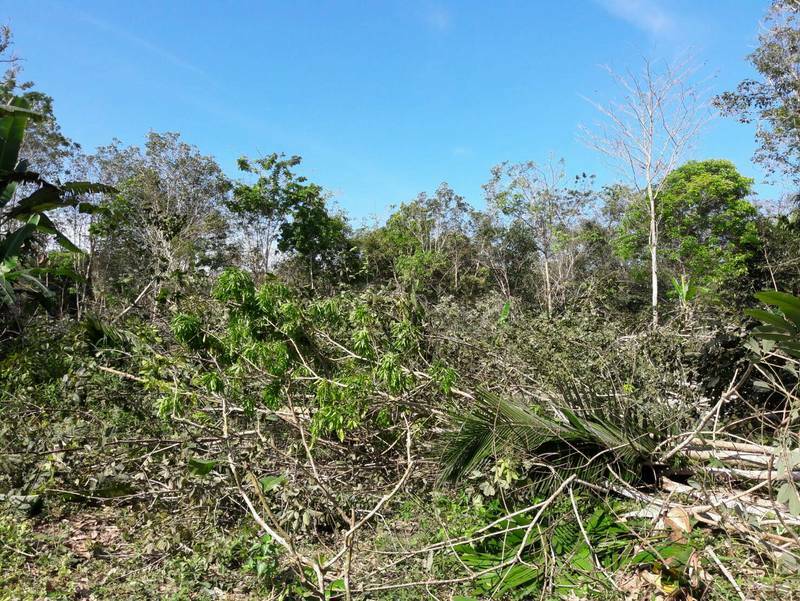 While officials cut down the trees, on which local residents relied on to make a living, local resident Ampa Thongthep, 57, who claimed rights to occupy land in the area approached authorities with letters from the Ministry of Interior and the Phuket Provincial Office issued in October 2010. Both letters confirmed residents’ rights to live and earn a living in the area while officials determined what to do about the rubber plantations within the protected forest boundaries. “Today officials are only following government policy,” said Phuket Natural Resources and Environment Chief Kasem Sukwaree. Mr Kasem noted that the mass destruction of the rubber plantations should have come as no surprise to local residents. “We came today because forest officials in Thalang filed a police report of encroachment in March,” he said. 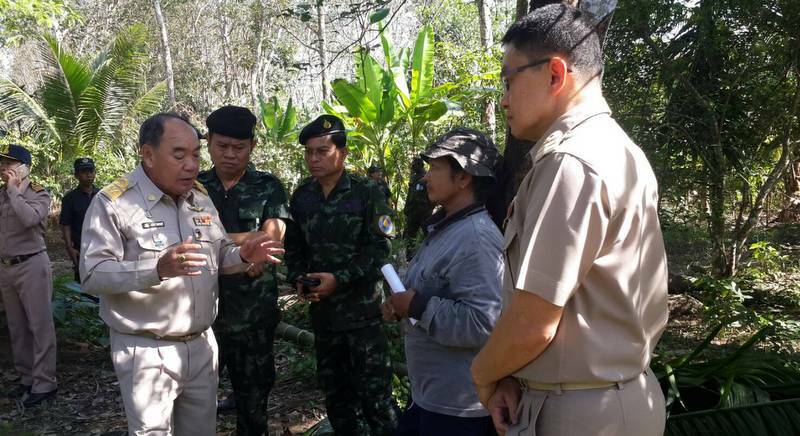 “The claimants have been warned twice, and most recently we gave them 45 days to remove their rubber trees and vacate the area, but they refused to comply,” he added. sir burr... where are you going to? Kurt...There is balance between rights to live and earn a living and forests. For how many years was this protected forest not protected by thai officials who duty is to protect? Must be many years seen the hight/length of the rubber trees.